SportMaster tennis court resurfacing & repair products are locally stocked and supported throughout the states of Texas. We have representatives and tennis court contractors that cover the massive state of Texas. From Dallas to Houston and El Paso, SportMaster is available everywhere. 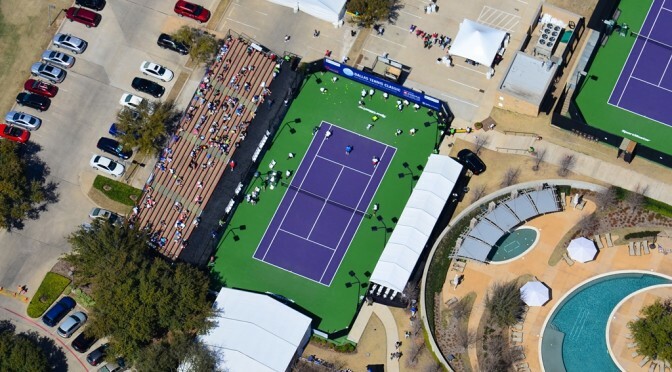 SportMaster is the official surface of the Dallas Tennis Classic, and can be installed on your tennis courts by qualified tennis court contractors in Texas. Whether your are looking for green and purple, or more traditional tennis court colors, SportMaster tennis court surfaces are available in 16 standard colors that will resist fading in the hot Texas sun. We can help you by creating a custom tennis court specification for your facility. Whether you are an owner of a backyard tennis court, an architect/engineer, or facility manager, SportMaster can prepare a scope so that you can get an apples to apples price from multiple tennis court contractors. Acrylic tennis court surfaces require very little maintenance. Unlike other surfaces, watering and brooming is not a required daily step. Acrylic sport courts benefit from wind and rain to “rinse” dirt and debris off of the court naturally. An occasional sweeping, blowing, or rinsing may be needed in certain areas, and avoid letting leaves or pine needles lay on the surface for long periods of time, for best results. Was the court built with proper drainage, slope, etc.